All the critters are here, and now it’s time to work on their pages! Once done, you’ll get to click on a character’s picture to find out more cool facts like size, diet, and how to pronounce those super long names! There, does this updated list help you? Could you move Douglas from the bottom of this page to in between Picasso and Dippy. Dimorphodon should be between those two since you are going by alphabetical order. Could you please reply to me? Thanks for editing this page. Could you give Skippy a footprint-shaped background to go with everyone else? I’m actually considering changing the other profiles. I prefer being able to see the entire body of the animal. You did, which I am used to now. Keep in your mind: Othnielosaurus. As well as that, you could also go for a 3-D printer and use it to create your own line of critters. I have a question: Could you start a new topic on the DTF for you to commission forum members to sculpt figures? There are some really good new species in here I haven’t heard of! Like Karaurus, I would like to add this salamander at some point. And more pterosaurs and prehistoric fish is always good, to add to the diversity of critters. 🙂 A few critters like Mymoorapelta and Vouivria will have to wait a long time though, because I already have Gargoyleosaurus on the short list, and I’m really looking for the more unique-looking sauropods. They have some really interesting body shapes within the generic plan that I’d really like to highlight, so if I add another brachiosaur anytime soon it’ll be Giraffatitan for a direct comparison with Brachiosaurus. I think he means Epidexipteryx, the smallest dinosaur with a valid genus name. It’s a really cool critter, but I saw a paper that determined that the layer of rock is from the Cretaceous, not Jurassic. It was difficult to tell for sure because of the way the rock layers fold over each other in that area. Read online and found out it was from the Jurassic. I have something else to tell you: do you prefer to do Neptunidraco before Machimosaurus or vice versa? Well, neither one is a dinosaur. Something else to tell, can I also give the animals their names? Like I don’t want you to be the only to give names. Good thing to consider. But how? Also, what I mean is if I can choose the name for any creatures you haven’t added yet to this website or Instagram. Like pick the name Monique for The Mongolarachne that will soon be in the shop. I know what you meant Angel. Again, I respectfully but firmly say no. 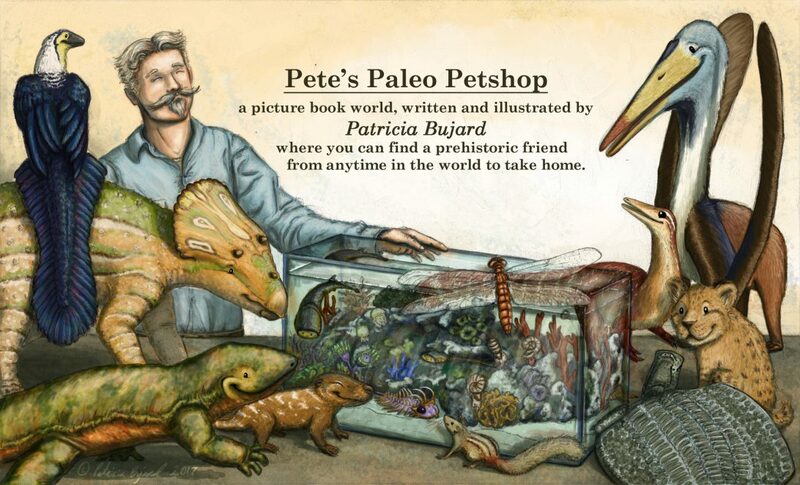 As the creator of the world of Pete’s Paleo Petshop, I choose which species appear, and I name my own characters. I am happy to receive species suggestions, since there are many prehistoric creatures I don’t know about. But names and choosing which species to illustrate are my decision. Well, ok, if it’s youre choice, maybe Monique will have a different name. Also, what do you mean by offering adoptable critters? Do you mean create figures of those critters then I pick the name? (Note: These are just the proposed name for each creature. Patricia will evaluate the names and therefore, the names are subject to change. I don’t understand the concept fully myself, since I’m not popular enough to make the idea of adoptable “pets” a realistic one yet. But the idea would be to somehow make characters available for adoption as virtual pets. Virtual meaning “not physically real” in this case, since obviously we can’t really have prehistoric critters as pets. The most realistic way to make this happen is illustrations. For example, I could illustrate several Allosaurus with different markings, size, build, age, and possibly a unique personality. Similar to Alfred in the fact that they’re Allosaurus, but all different characters. These illustrations I would sell with an official “seal of adoption”. Each would be unique, and the buyer would be able to name the critter they adopted just as if they adopted it from Pete’s shop. If I can somehow incorporate this idea into some sort of augmented reality, or at least a figure, that would be awesome. But in all honesty it would need to be limited to illustrations for a while. To end this long discussion, what can you say about all of the creatures I mentioned in my last comment? Which names will you use and which will you not use? As well, what are your thoughts and opinions with the creatures I mentioned? I would like to know. Also, will you add a new critter in March? Could you add them in please? Well, look at your home page. I put eight fan suggestions that you can analyze. These are very cute and I love that they’re accurate as well. What a wonderful idea for a children’s book! At the moment I’m concentrating on Jurassic animals. It may take a couple of years, but I’ll certainly keep Torvosaurus in mind when we dip into the Cretaceous. As well as that, how about giving the name Tanner to the Torvosaurus. Leah, the Torvosaurus will be male and will have that name, unless Patricia changes her mind, which shouldn’t happen. As well as that, she should create a book called Jurassic Overview, which reviews over 225 prehistoric animals from the Jurassic. Just to be sure Patricia, Torvosaurus lived in the Jurassic, not the Cretaceous. Thank you Angel, you’re absolutely right. I don’t know what I read that made me think it was a Cretaceous animal. I’ll add him to the list! All of these are Jurassic animals, right? If you read my comment, your book will get a sequel with more animals. I would like to see thing from other period and eras. Also, this took me a while, but I thought of an alphabet of prehistoric animals from the Triassic. Can you try to use all of these? Thank you for the suggestion. Many of these critters and other critters will be featured once I get to the Triassic. There are lots of interesting animals to include in a picture book, but I’m afraid the alphabet will have to wait. ☺️ I have a lot of ideas planned already, but not enough time to get them done fast enough! So imaginative! Great mix of children’s storytelling & science. You should gather these into a book! I like the format! Very simple and easy to navigate through. 🙂 Also, I think dilophosaurus is starting to grow on me. It just might become a new favorite of mine! Heheh, yeah. 🙂 I wonder how big he was? Great! How long, on average, do you think it takes you to paint each dinosaur? Wow, those dinosaurs look different! Thank you for taking the time to do this. Castorocauda would be my choice if we only had a swimming pool. Thank you! Cassie is lots of fun. 🙂 More are coming soon!